As with so many other things in our daily lives, funeral traditions have changed and evolved over the years. Recently, we talked about Victorian-era funerals and mourning customs; in this blog we’ll look at funeral traditions of Colonial New England, which differed from those of the middle states and the South at the time. In the 1600s, death was an austere affair; the Puritan’s religious beliefs prevented the expensive and showy funerals that came later in the 18th century and during the Victorian era. In an effort to turn away from what the Puritans considered idolatrous Catholic rites of their European homelands, no eulogies and sermons were offered at funerals. The funeral service was a mostly silent affair. Written verses or laudatory messages were affixed to the bier, later to be gathered and published. There were two, and sometimes three, sets of the pallbearers. Because the body was carried from the funeral service to the cemetery, which could be a distance away, the younger men – known as under bearers – would carry the bier, while the older men carried the pall, a cloth spread over the coffin. If the cemetery was very far away, a second set of under bearers would be appointed to divide up the physical burden. Caskets were simple oblong boxes and gravestones were humble slabs of stones with an inscription. 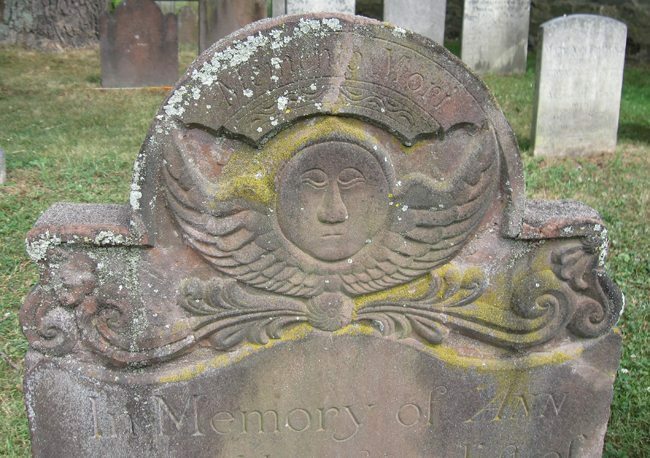 While other regions buried their dead in graveyards located at churches, most towns in New England set aside land and created common community burial grounds. “… The announcement of a death was a signal for cessation of daily work throughout the neighborhood. Kindly assistance was at once given at the house of mourning. Women flocked to do the household work and to prepare the funeral feast. Men brought gifts of food, or household necessities, and rendered all the advice and help that was needed. A gathering was held the night before the funeral, which in feasting and drinking partook somewhat of the nature of an Irish wake. Much New England rum was consumed at this gathering, and also before the procession to the grave, and after the interment the whole party returned to the house for an “arval,” and drank again. The funeral rum-bill was often an embarrassing and hampering expense to a bereaved family for years. “This liberal serving of intoxicating liquor at a funeral was not peculiar to these New Hampshire towns, nor to the Scotch-Irish, but prevailed in every settlement in the colonies until the temperance-awakening days of this century. Throughout New England bills for funeral baked meats were large in items of rum, cider, whiskey, lemons, sugar, spices. “To show how universally liquor was served to all who had to do with a funeral, let me give the bill for the mortuary expenses of David Porter, of Hartford, who was drowned in 1678. ‘By a pint of liquor for those who dived for him……………….. 1s. By a quart of liquor for those who bro’t him home……………. 2s. By 8 gallons & 3 qts. wine for funeral…………………………… £1 15s. By Barrel cyder for funeral ……………………………………….. 16s. One custom in Colonial New England was to send as an invitation to the funeral, a pair of gloves to each friend and relative who would attend the funeral. They could be white, black or purple and could often add great expense. For people of prominence, thousands of pairs could be sent out. The minister always got a pair, and it is said that one Boston minister, who kept a record of all of the gloves he was given, was the recipient of 2,940 pairs during his lifetime. It was common for families of the deceased – especially the wealthy ones – to create mourning rings and give them out to family, close friends – and of course the minister. According to Earl, the rings were “gold, usually enamelled in black, or black and white. They were frequently decorated with a death’s-head, or with a coffin with a full-length skeleton lying in it, or with a winged skull. Sometimes they held a framed lock of hair of the deceased friend. Sometimes the ring was shaped like a serpent with his tail in his mouth.” Many were inscribed with a message, such as “Prepared be To follow me,” and were handed down through generations. As the years passed, the practices became increasingly ostentatious and colony leaders sought to limit the expense and ostentation by levying a 50-pound fine for anyone found distributing wine or rum and funeral rings; restricting gloves to the pallbearers and clergymen; and – in an effort to limit what undertakers could charge for bell-ringing – limiting the number of times a bell could be rung. Phaneuf Funeral Homes and Crematorium has served the public since 1906. We are the largest provider of funeral services in the state, and we operate three full-service funeral homes, two crematories, two non-denominational chapels, and a cremation society. To request a free brochure and planning guide, click here.